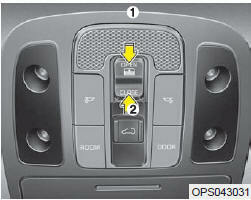 Press the sunshade open button (1). To stop the sliding at any point, press the sunshade control switch momentarily. Press the sunshade close button (2). The sunshade will be closed halfway. The sunshade will be closed halfway, then sunroof glass will be closed and then sunshade will be fully closed finally. Push the sunroof control lever forward or pull it down. To stop the sliding at any point, press the sunshade control switch momentarily. Wrinkles formed on the sunshade as material characteristic are normal. Do not pull or push the sunshade by hand as such action may damage the sunshade or cause it to malfunction. Close the sunroof when driving in dusty environments. Dust may cause a malfunction of the vehicle system.